BRANDIT RAVEN WIRE SHIRT MENS COTTON FLA.. HELIKON MENS TACTICAL BASEBALL CAP VENT..
CONDOR TACTICAL BREATHABLE ADJUSTABLE CA.. M65 COMBAT FIELD JACKET MENS VINTAGE TYP.. BRANDIT GIANT M65 JACKET MENS MILITARY PARKA US ARMY COAT WARM ZIP OUT LINER. The exceptionally hard wearing M65 Giant Jacket is based on the world famous US M-65 Field Jacket which was originally designed for the US Armed Forces. The M-65 Army jacket in a vintage style has become a real cult item. Perfect for the wintertime with its nylon teddy-like lining, which is attached by a zipper. The outer jacket is made of a high-quality, washed cotton and can also be worn without the lining, which makes it perfect during spring time or in the fall. Typically for the M-65 jacket are two, large chest pockets, two spacious flap pockets in the front, epaulettes with pressure buttons and a concealed cotton hood with cord string. Several applications such as an Army rank on the left sleeve or chest patches give this jacket a great look. Lining: 67% cotton, 33% nylon. Please refer to the below size chart as a guide to assist you in making your size choice. PLEASE NOTE THAT THE GIANT JACKET COMES UP LARGER THAN EXPECTED AND WE THEREFORE RECOMMEND ORDERING A SIZE SMALLER THAN USUAL. 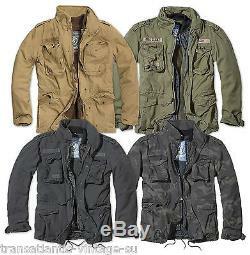 BRANDIT M65 GIANT MENS MILITARY PARKA US ARMY JACKET WINTER WARM ZIP OUT LINER. The goods that you order will be delivered to the address that you give when you place your order. In the unlikely event that there is to be a delay, we will contact you straight away to advise of this. Please be advised that you can always upgrade the service of dispatch when ordering. Genuine postal losses are rare in the UK. We want you our customer to have complete satisfaction every time that you shop with us. If you change your mind and want to return items, no problem! HOWLETTS FARM CANTERBURY KENT CT48HW. Or ring us with your order details including your Order No. Print off and attach the label to your return package. MILITARY PERSONALISED ARMY DOG TAGS 26.. A2 LEATHER FUR COLLAR FLIGHT JACKET AIRF..
VIPER MINI MODULAR BACKPACK PACK HYDRATI.. VIPER MODULAR POUCH OPERATORS TACTICAL M.. VIPER SPECIAL OPS MOLLE BAG POUCH MILITA.. MAGNUM M-PACT 1 PAIR BOOT INSOLE SPORT.. MAGNUM MX-3 CREW SOCKS MENS BLACK IRON G..
Bl A1ebayer great price and quality many thanks. 98 Very happy with the product. J4 Good price and quality. Kr The item was outstanding. Will use again and would recommend. Get in touch with us. The item "BRANDIT M65 GIANT MENS MILITARY PARKA US ARMY JACKET WINTER WARM ZIP OUT LINER" is in sale since Wednesday, October 16, 2013. This item is in the category "Clothes, Shoes & Accessories\Men's Clothing\Coats & Jackets".